Looking to introduce dinosaurs to your next Savage Worlds game? A Savage Guide to Dinosaurs features nineteen fully statted dinosaurs including classics like the Triceratops and the Tyrannosaurus Rex. Also included is an original adventure titled Dino World! "Dino World, once humanity’s greatest achievement, is now surrendered to the dinosaurs who once served as exhibits. But not everyone is satisfied with leaving dinosaurs behind. Eric Winslow, CEO of FTRE, wants a dinosaur and he’s willing to pay. The party has been hired to retrieve three eggs from the defunct Dino World theme park." This mission pack contains five missions for use with the Project Lucifer Setting for Ghost Ops - Modern Covert Operations RPG. The Operatives are sent to find the Spear of Destiny before BrightCross Mercs in this one sheet mission. The operatives of Phantom Squad are sent to Bolivia to shut down a Project Lucifer operation, but everything is not what it seems. Sent to retrieve data from a research lab recently firebombed. But BrightCross also wants whatever was on the disc. A refugee camp is more than what it appears, are refugees being used as test subjects? A one sheet Mission. Sent on a bug hunt underground, to search sewers and subway stations for a supernatural presence, led by a psychic presence. This is not intended to be a comprehensive ruleset, but a list of changes between Savage Worlds Deluxe (SWD) and Savage Worlds Adventure Edition (SWADE) to help in converting previous works. Inside this amazing-looking volume, you’ll find an entertaining bundle of goodies to enhance your Savage Worlds Adventure Edition fun. There are four immersive settings, exciting new character options, awesome gear, new custom setting rules, five Creature Features, twelve Savage Tales, two short stories, a 6-page comic, and more to make your fun faster and even more furious! With original content and contributions for Freedom Squadron, Low Life, Saints and Synners, and Titan Effect, there's plenty here for you to enjoy. We hope you'll want to page through The Savage Sign again and again! The Tomorrow Legion faces off against new apocalyptic threats from the darkest corners of North America and Earth's ancient past! Building on the incredible success of Rifts® for Savage Worlds comes three new 192-page Worldbooks further detailing the factions, locations, and threats of Rifts® North America. Inside you'll find new allies, armaments, and abilities to aid Tomorrow Legionnaires in their fight against the evils of the Megaverse®. All three books are 192 pages, hardback, and full-color throughout! 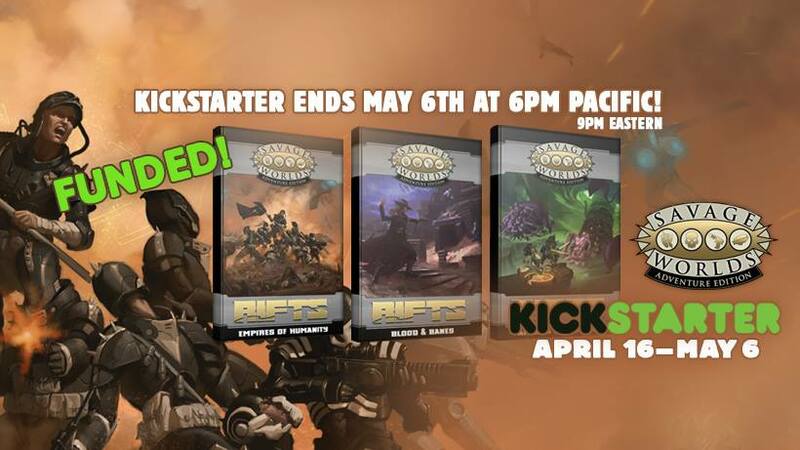 Previous Rifts® backers also get updated core PDFs automatically! Merchant US$ 1 or more Advance Ordering Option for Retailers Only! Money is power? Knowledge is power? Maybe where you come from, but around here, power is power. After the Great War, the twin cities of Niagara Falls, New York and Ontario remained empty for decades, except for the occasional scrappers who searched them for ever-decreasing salvage. Then Ma Parker and her associates arrived. She and her crew repaired the hydroelectric generators along the Niagara River and got electricity flowing to what was now a single city known as the Falls. The Falls thrives and is famous for the electric lights that brighten the sky at night. Travelers flock to its trading posts, gambling dens, saloons, and entertainment halls. Some claim the Falls is decadent and filled with immorality, but the people who live there see it as the best chance for humanity’s survival. The Falls is set in the Broken Earth setting, but can be used with any post-apocalyptic campaign. This product and all the others in the Tales from the Great Lakes series are available in a money-saving bundle. Enter the Battle with VENOM Armed with the Latest Intel! The Freedom Squadron SWADE Operations Memo is a free download to set you up with all the information and guidance you need to update your Freedom Squadron Commando's Manual and Freedom Squadron Plans & Operations Manual to the absolute latest iteration of the Savage Worlds rules! From mad cultists calling up tentacled horrors to holy priests praying for warrior angels to clockwork contraptions crafted by a mad scientist, the summon ally Power is found throughout just about every Savage Worlds setting. Using this book, you'll be able to make that power your own, customizing your allies to fit the concept you have in mind for what your hero calls to battle - or use one of the deadly rivals or monsters in this book to challenge your players! A system for designing your own allies at each rank, allowing you to build your summoned allies the way you imagine them and make sure things are balanced. A selection of new Edges and Hindrances (10 in total) related to conjuration and its practitioners. 36 sample creatures to summon across all Ranks, all created using the ally creation system, from the sneaky Scout to the ship-shattering Talosan Titan. 10 fleshed-out NPCs to use in your game that demonstrate the use of the mechanics and concepts found in this supplement, ranging from an elven ecoterrorist to a dinosaur-summoning, time-traveling big game hunter. A bank heist turned to a hostage situation, and the player characters are stuck in the middle! It’s 1976 in San Francisco, and the player characters are forced to confront their past when a disgruntled ex-cop demands they act as negotiators, after he takes hostages at the bank. The local cops have cordoned off the area, S.W.A.T. teams are in place, the F.B.I. is “in charge,” news teams are competing over the best story, and curious citizens have amassed around the perimeter. 1976 San Francisco, the adventure is inspired by the cop and detective shows of the era, such as Starsky & Hutch, Kojak, Police Story, etc.